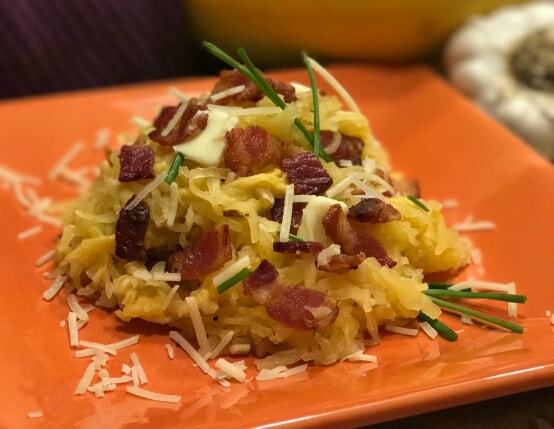 Spaghetti squash is the ultimate low carb, gluten-free base. 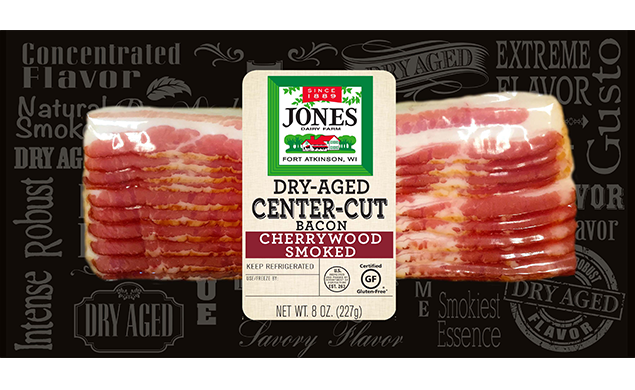 Jazz it up with Jones bacon, butter, cheese and spices for a flavor-rich side dish. Cut stem end off spaghetti squash. Slice squash into rings, approximately 1 inch thick. Using a spoon, scrape seeds and pulp from rings. Discard seeds, pulp and stem. Alternatively, seeds can be washed, seasoned and toasted. Lay rings on parchment covered baking sheet and brush surface of each ring with melted butter. Bake for 40-45 minutes. Strands should separate into “spaghetti” when scraped with a fork, but should not be mushy. While squash is baking, cut bacon into 1/2-inch pieces and fry in large skillet over medium heat, stirring often, until bacon is cooked and almost crispy. Remove bacon from skillet to paper towel lined plate and set aside. Reserve 1 tablespoon bacon fat and discard the rest, or save for future cooking. Sauté onion and garlic in bacon fat over medium heat, until translucent and soft. Remove from heat. Remove squash from oven and cool slightly. Remove shells from each ring of squash and separate flesh with a fork. Place “spaghetti” into large bowl and add melted butter, parmesan cheese, bacon, onion, and garlic and toss until thoroughly incorporated. Season with salt and pepper to taste. Garnish with chives and additional parmesan cheese if desired. I love this recipe and make it at least once a month. I alternate what ingredients to out in like spinach, mushrooms, carrots, or with bacon/sausage. Either way it is delicious!